Why you should care about retirement? Most of us exchange time for money during our careers and typically work for an employer who pays a monthly salary. This supports our lifestyles and assuming we’re following the baby steps should allow us to put aside a percentage of our income each month for when we are no longer able to work in later life. The primary consideration while working is to follow the practice of living on less than you earn and ideally no more than 90% because this will allow you to invest in your retirement without impacting your current lifestyle. One interesting observation from talking to young people is their lack of preparation for retirement, which makes a lot of sense when you won’t see a direct benefit for 30+ years. The paradox is that this is precisely the right time to be thinking about it because you have the luxury of time on your side and the magic of compound interest. What about the UK government, won’t they take care of me? You’ll need more money than just the State Pension when you retire. As it stands today, the most you can get from the State Pension is £8,546.20 a year. Could you live on this? I know I could not. The risks of not having a retirement plan are so severe that the government has introduced a compulsory scheme called automatic enrollment. In the UK, many workers missed out on valuable pension benefits, because their employer didn’t offer them a pension, or they didn’t apply to join their company’s pension scheme. So, the government has introduced the automatic enrolment scheme to make it compulsory for employers to enrol their eligible workers into a pension scheme automatically. The employer must also pay money into the plan which from 6th April 2019 increases the contributions to 8% with 5% from you, 3% from your employer and 1% tax relief from the government. But today’s young people are delaying both the purchase of their first home and having children. With this in mind, by the end of your career, you would hope to have enjoyed an excellent job with several promotions and a certain level of comfort. If the goal is to have fabulous holidays every year, then you’ll need to save a lot more than the government’s recommended 8%. What is compound interest and how does it help me? Albert Einstein once called compound interest “the greatest mathematical discovery of all time”. But you don’t need to be as intelligent as Einstein to understand compound interest. In simple terms, it’s where you earn interest on top of interest which is one of the most powerful forces of investing and is the way that we will build wealth over time. 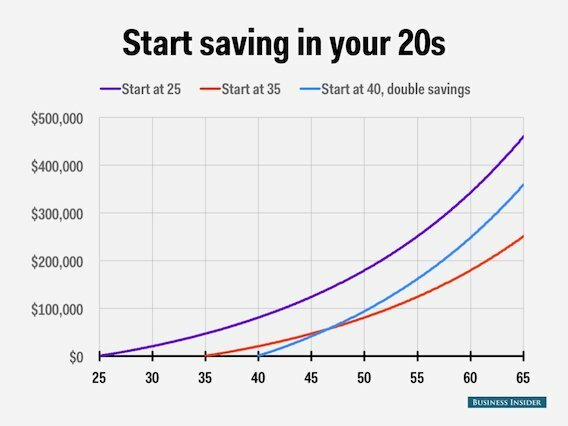 To really understand how this works for us, the following diagram from BusinessInsider shows the effect of investing in your 20’s, 30’s and 40. With a conservative 5% rate of return, starting at 25 versus 35 means that those extra 10 years will really work hard and deliver almost double the size of your pension pot. Deferring your decisions to starting at 40 makes a huge difference because you have 15 or 5 years less and therefore have to double your contributions to catch up for lost time. Investing for retirement reminds me of the story of the tortoise and the hare, where you are in this for the long run and must take a slow and steady approach and leave your plan to run its course. The easiest way is to take advantage of your companies pension scheme as they will very likely offer a better deal than the government scheme. For example at Sky, they will provide 6% so long as you contribute 3% making 9% total, which is a great start and from 6th April 2019, they’re increasing their match to 9%, if you contribute 6% for a 15% total. How much can I contribute to my pension scheme? As we’ve previously mentioned, you will want to contribute enough to obtain the effectively free money that your company offers. In my own case, my personal circumstances changed, and after making the calculations, I had to increase my contributions to make up for lost time. Can I transfer my pension when I change employers? Yes, each pension is held in your name and is transferrable to your new provider. For example, I had two pension plans from previous employers before Sky and arranged for them to be transferred to Sky, which was straight forward and took about 2-3 months to complete. What are the UK tax benefits of a pension scheme? Most companies pension plans are set up using salary sacrifice. What this means is that you agree to ‘give up’ a percentage of your salary, and in return, they add money to your pension account. Because this is taken out first, the salary you are being paid is lower; therefore, you pay less tax and National Insurance. Additionally, a big incentive for employers to offer this fantastic benefit is so they can attract and retain talented people in their business. Personally, I love the idea of keeping more of my hard earned money and receiving tax relief from the government on top. Where are my retirement funds invested? In the UK, most employers provide what’s called a lifestyle plan, where they invest your monthly contributions into a pre-set investment approach. These funds are invested in the various countries stock markets, company debt and government debt also known as bonds which earn interest. In the Lifestyle plan, your savings will automatically move between funds, according to how long you have until you plan to retire (your Target Retirement Age). As your investments change automatically, you don’t need to manage this yourself. The main benefit of this approach is that your pension runs on autopilot, taking a higher risk when you’re younger and reducing the risk as you approach retirement, typically around 65. Can I increase my pension contributions? When should I check my pension progress? Living in our mobile world and quoting the popular phrase “There’s an App for that“, I would advise you check no more than once a month. The pension providers also have to provide you with an annual statement, so this is probably the best time to review progress and see if you need to increase your contributions. Okay, now that you have a plan for retirement, let’s continue improving your financial education and please leave comments in the section below.